App developers are creating tools that autistic children can use to cope with social and emotional situations that challenge them at home, at school, and pretty much anywhere they tote a mobile device. These devices can be a cost-effective solution for parents, school administrators and healthcare providers looking for ways to serve the unique needs of this growing population. An added benefit to the devices is that children don’t look different from their peers when they use them. The following apps were selected based on their value to children on the autism spectrum. For more autism app recommendations, visit Autism Speaks. It’s challenging for children with autism to apply what they work on in the clinic to real-world situations, says Bowers, who specializes in social skills for children with autism. “They forget things, or things don’t play out the way they thought it would,” he says. As a result, Bowers created what he calls a “pocket social skills therapist,” officially called Sōsh for his patients and fellow counselors. 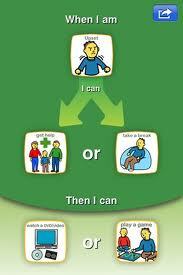 The tool provides exercises, strategies and information for home, school and therapy. App users consist of students in elementary school to those in college – ages 9 and up. Bowers says that this age group is underserved since most therapies focus on early intervention. When Michele Walker’s son was diagnosed with dyslexia, she decided to put her background in educational psychology to work by creating an app to support his preference for visual-based learning. “Visuals travel to your brain at the rate of a high-speed Internet connection,” says Walker. In 2005, she founded Bee Visual, LLC, and developed Choiceworks. The Choiceworks app is a picture-based learning tool that helps children complete daily routines, understand and control feelings, and improve their waiting skills. Typical visual support systems consist of a large, expensive binder that is shared by a few people in a school. By comparison, anyone with a mobile device can download Choiceworks for $14.99. Teachers, parents and healthcare professionals can use Choiceworks to build schedules for their children on the fly. Once they’ve completed their schedule, kids are rewarded with an activity of their choice, such as watching TV or reading a book. Walker says the choices empower children. Earlier this year, KenCrest released a free app called Mi-Stories for adolescents and adults with autism. The app contains a series of video-based social scenarios ranging from two to four minutes long that target communication and social behavior in community settings and work environments. Users can discretely rely on the apps to model appropriate behavior when they encounter these situations. KenCrest is creating the apps using an internal grant that allows it to build tools to help people in its service area. According to Lord, the nonprofit also applies for grants from autism organizations, the federal government and other sources so it can further develop these products. App developers caution that not all devices and apps are appropriate for every child. According to Lord, before purchasing a device or app, individuals must consider the unique needs of the user. This article was adapted from the April 2012 issue of Medicine on the Net®. Copyright © 2012 HCPro, Inc., 75 Sylvan Street, Danvers, MA 01923. 781-639-1872. Used with permission from HCPro.